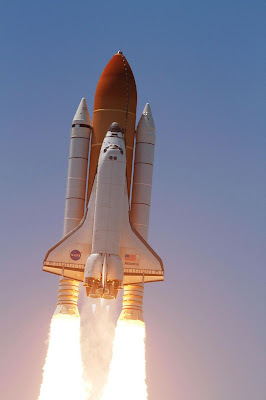 Space Shuttle Atlantis, on mission STS-135 to resupply the International Space Station, lifted off on July 8, 2011 as the historic final flight of the 31 year old NASA STS program. Atlantis' four member crew included Commander Christopher Ferguson, Pilot Douglas Hurley, Mission Specialist 1 Sandra Magnus, and Mission Specialist 2 Rex Walheim. Atlantis touched down at her home base, the Kennedy Space Center, on July 21, 2011 after a fourteen day mission in space. You can read more about Atlantis' final flight on Wikipedia. If you are visiting Florida, you can see Atlantis as part of a new public exhibit at the Kennedy Space Center Visitor Complex.